The concept dates back at least to 1938 and a children’s book called Der Giftpilz, or The Toadstool, in which a mother explains to her son that it only take one Jew to destroy an entire people. The book’s author, Julius Streicher, also published a newspaper that Adolt Hitler loved to read, Der Sturmer. The newspaper published anti-Semitic, anti-Catholic, anti-communist, and anti-capitalist propaganda. In 1933, soon after Hitler took power, Streicher used his newspaper to call for the extermination of the Jews. Here are actual passages from The Toadstool (courtesy of The Intercept). The connection between anti-Semitic Nazi propaganda and Islamophobic Trump propaganda is real. Eerily real. This is not the first time that Trump’s campaign has drawn inspiration from Hitler and Nazism. An article I wrote in December 2015 compared how Trump and the Führer rose to power by using similar political rhetoric against minorities. It is eye-opening to think that the next president of the United States of America uses the same bag of tricks as someone who called themselves a Nazi. 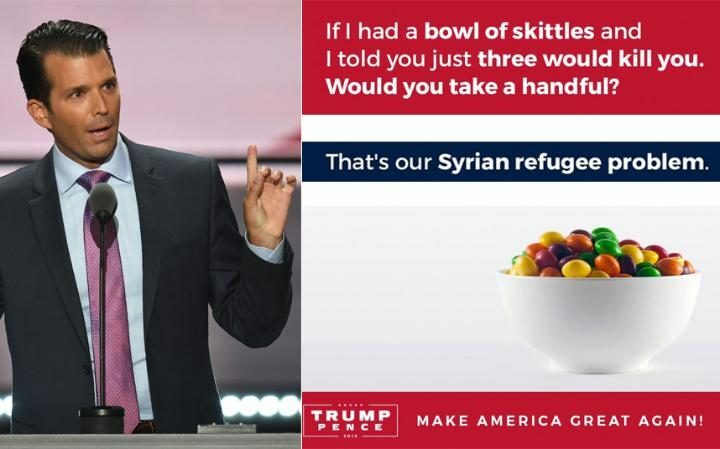 Apparently in his world humans are as simple as skittles, you keep the ‘good’ ones and throw away the ‘bad’. Wonderful insight on such an unsettling nightmare that’s quickly becoming a reality….